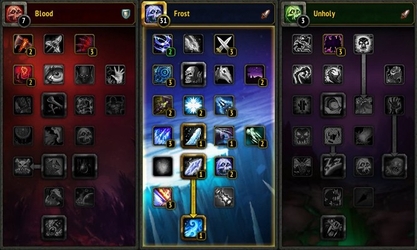 In this article, we present you with various talent trees for Frost Death Knights (WoW 4.3) that you can use in specific situations. We also give you pointers for customising your talent tree and adapting it to a particular boss. The other articles of our Frost Death Knight guide can be accessed from the table of contents on the left. Both the dual wield and the two-handed playstyles work well for Frost Death Knights, and yield similar results in terms of DPS, although dual wielding is slightly ahead currently. Here, we provide you with the only viable builds for both playstyles. The following build provides longer disease durations and requires them to be refreshed less often, resulting in an easier to master playstyle. The following build provides slightly more runic power, but has shorter disease durations (which makes them harder to keep up all the time) and is, therefore, harder to master. First, we present you the talents that you can play with to build your own talent tree before explaining what each of the interesting glyphs does. There is essentially no room for optional talents, other than choosing between dual wielding or using two-handed weapons, and between the Blood Tap or Epidemic builds. Chilblains, which causes your Frost Fever (most notably applied by glyphed Howling Blast) to also slow the movement speed of affected targets. The choice is up to personal preference, but we feel that on any boss encounter where interrupting may be required, Endless Winter is the superior choice. Furthermore, none of the other talents provide any DPS (and most often they provide no utility, either), so you can safely stick to Endless Winter at all times. Glyph of Frost Strike, which reduces the cost of Frost Strike, allowing you to cast it more often. Glyph of Obliterate, which increases the damage of Obliterate, your trademark single target ability. Glyph of Howling Blast, which causes the enemies hit by Howling Blast to instantly become affected by your Frost Fever. The only exception to using the above glyphs is in AoE situations, where you will prefer to replace Glyph of Obliterate with Glyph of Icy Touch. This glyph boosts the damage done by Frost Fever (and Frost Fever will automatically be applied to all enemies thanks to your Glyph of Howling Blast). In order for this glyph to be worth using, the AoE phases of the fight must either be extensive or require large burst. Glyph of Anti-Magic Shell, which increases the duration of your Anti-Magic Shell by 2 seconds, making it easier to time it in order to avoid boss mechanics. Glyph of Dark Succor, which buffs the healing received from the first Death Strike for 15 seconds after killing an enemy that grants experience or honor. This glyphs is situational and will seldom come in handy. Glyph of Hungering Cold, which removes the runic power cost of Hungering Cold. This is useful for fights where you are using Hungering Cold to freeze adds, but it is not useful otherwise. Glyph of Horn of Winter, which increases the duration of your Horn of Winter by 1 minute. Glyph of Blood Tap, which causes your Blood Tap to no longer deal damage to you (normally, it costs 6% of your base health). Glyph of Path of Frost, which allows you to fall from a greater distance without taking damage, when landing on Path of Frost.